"Whilst we're not in NSW, we heard nothing about hundreds of deaths last year ...and I hardly think it would have gone unreported! Barry had a bad dose last year as did Robyn, but it hardly ranked in the league they're suggesting below. Five children died in Perth from a "flu-like" illness, but no details of underlying conditions or vaccination status was released. I know they had panic stations at the Royal Perth hospital with frantic parents of sneezing and coughing kids descending en masse, but that was due to media hysteria more than anything else. Vaccine sales must be slow so more scaremongering!"---Sue. The last major outbreak in England and Wales came in 1989-90, when 23,046 people died, compared with a seasonl average of around 4,000. 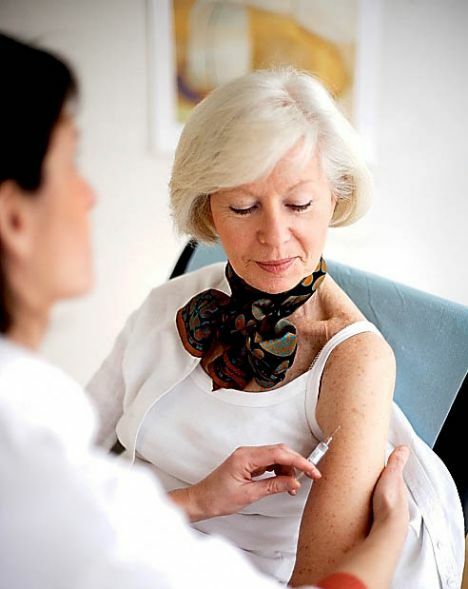 The elderly are those most at risk because they have weaker immune systems. Professor Bruno Lina, head of the National Influenza Centre in Lyon, France, said: 'The upcoming season is notable in the sense that among the three new vaccine strains, there is one that has proved to be very virulent in Australia. Influenza comes on suddenly and is characterised by fever, tiredness, dry cough, sore throat, nasal congestion and an aching body. Many victims fail to seek remedies, spreading the disease further. In Britain, flu vaccination is offered to everyone over 65, many carers of the elderly or disabled and those with a range of conditions including asthma, heart disease and diabetes. Residents of care homes are also offered the vaccine because a virus would spread very quickly among them. Health workers are routinely vaccinated because of the dangers of them passing flu on to vulnerable patients. The Department of Health is considering offering the jabs to pregnant women as well. Dr Laver warns, however, that the vaccine cannot always be relied on. He wants the Government to make drugs such as Tamiflu, which is taken after flu symptoms strike, to be available over the counter. A Department of Health spokesman said: 'Preventing and treating flu is a serious issue, and the NHS is well prepared. Seasonal flu vaccination is available free to everyone in the at risk groups.